This is a film I have often felt has been overlooked. I am a huge fan of Ken Follett, the author of the book that this film is based on. I feel this is a movie that captures the wonderment of the novel. 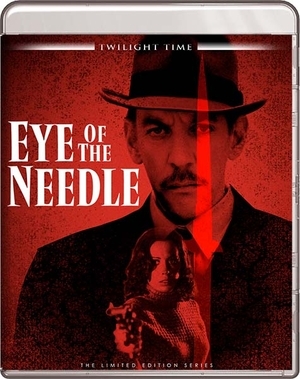 I was really excited learning that Twilight Time was going to be releasing this on Special Edition Blu-ray. I own it on VHS and DVD and was hoping that a company was going to be bringing it to Blu-ray and what better company than the amazing Twilight Time. Ken Follett is a master at words and capturing those words in a brilliant story of suspense, deception, and a killer spy. The story is Set during WW2. A ruthless one of a kind Nazi spy, who is code-named The Needle is hard at work, working for the victory of the Nazi's. This is in reality a truly terrifying subject matter of thrills and dangerous actions. A great watch with thick plotted actions and edge of your seat moments with pure tension to cause everything in the emotion department for the watcher or even the one reading the book which I highly recommend you do so, watch the movie and then read the book or read the book and then buy this wonderful Special Edition Blu-ray by Twilight Time. This is not about explosions or shoot outs like James Bond type of spies, this is a more believable reality based plot. This is about those stealthy true spies. The introduction to the characters and the buildup of personas is a well thought out process. Flawless through actions by tight direction and performances on screen. They are relatable and true. From your main characters Faber and Lucy which both are excellently acted characters. Twists and turns. Surprises that work and are plausible. I think what really stands out is the pure cat and mouse like game. Murders, secrets, thrilling ordeals give this movie a stable that is often mesmerizing. Follett in his book writing gives it his all in this excellent story and Richard Marquand in directing gives it his all. I recommend this wonderful spy tale. A superb movie of surprises, drama, action, suspense and just about everything you need in a good movie. I do feel the sets, costumes place you there in England during the war and also the characters are all mapped out and crafted, because this is a well plotted story through filming. Directed by an amazing director that stands out for me, in being a part of one of the greatest Science Fiction Saga series ever in film. He directed the conclusion to the Star Wars saga. His Return of the Jedi is a fine example of fantasy, adventure, and an ultimate end to a great generational trilogy, that was one of a kind. Sadly, what is so heartbreaking about this visionary expertise in directing tight stories and characters on screen is that he died so young, and left what I believe would have been a continuing career in amazing film. He died at 49 years old, which is so unbelievable. Died of a stroke, shocking and sad to the film loving world. He clearly in my viewpoint could have went on creating amazing movies. I enjoyed all the emotions, drama and the love reality inside the plot, all went well with the film, just like in the book, even though it was a WW2 film, you as the watcher know how the War ends, yet the movie is still able to capture the reality of what is going to happen next. Faber has a great weapon and also Follett describes the murders in amazing detail in the book and I think Marquand did a great job in bringing those murders to life on screen. I enjoy books that truly have a sense of real life history and when they weave fiction around them they end up creating a believable reality to the book and I feel Marquand captured that believable reality that Follett did so well in the book form. This is one of those movies that stand the test of time. Even though you know the outcome to WW2, it still works for the imagination. The best reason that it works is the characters, because they are so crafted, that the watcher becomes a part of the action, the spy like drama and most of all the thick suspense running wild on screen. Stanley Mann did a great job as the screenplay writer in bringing the book to screen form. I feel he captured everything that was great about the book and was able to bring that suspense to screen. This 1981 movie stars the amazing one of kind master performer Donald Sutherland as Faber and the beautiful, stunning Kate Nelligan as Lucy. Nelligan is a smart, beautiful amazing actress that I feel has never gotten the push and house hold name of actress that she deserves. She is a stunning performer and makes you believe in her character. No matter the performances I see her in she comes to life in great, rich detail. Her characters are real. They come across as living breathing beings, not just on screen but as if they are next to you. Her performance as Lucy is one of those performances that you remember. This was originally in book form was titled Storm Island in 1978 when it was published by the Penguin Group. This was the book that made Follet a successful novelist. He was awarded with the Edgar Award for Best Novel by Mystery Writers of America. And so you can understand how a book that praised would become a film. I think the film version is close and spot on to the book. I have read the book twice and watched the film many times and they both are worthy to praise. I am super excited at the beauty and work that has been put into this Blu-ray version by Twilight Time. They are so amazing at crafting in audio, video and is in a beautiful transfer. I have seen this film so many times from VHS to DVD to television, and this film has never looked any better. Twilight Time has created a fantastic update and high definition transfer of beauty. The audio is crisp and absolutely spot on. Another wonderful example of the amazing talent of this company in supplying perfection to Blu-ray’s. Isolated Score Track: Something that makes this film all the more dynamic and rich in tone is the flawless music by composer Miklos Rozsa. His musical genius really needs no introduction to film lovers or music lovers in general. If you’re a film fan, then you should know this master. Twilight Time has honored this one of a kind and brilliant artist with this special edition Isolated Music Track. All one has to do is look at his career. He has one many Academy Awards for the mastery behind such films as 1945’s Spellbound, 1947’s A Double Life, 1959’s Ben-Hur, that should sum it up nicely in showcasing just who he was. He died in 1995 but left a vast array of excellence that shines and few cannot even touch. His music is still begin used today which it should be. My personal favorite of his, is his work on one of the great Film Noir’s of all time, the one and only 1944’s Double Indemnity. He did so many memorable films, all one has to do is scan his career and be amazed at his accomplishments. Audio Commentary with Music Historian Jon Burlingame and Film Historians Julie Kirgo and Nick Redman. A wonderful listen by some amazing persons. Kirgo and Redman are rich in film history and are perfect to any lover of cinema. They truly know their stuff and that is what makes these audio commentaries priceless. Loved hearing from Music historian Jon Burlingame, priceless as well. This movie and excellent Blu-ray is a worthwhile treat for any lover of thick plotted WW2 action, suspense drama, it leaves the watcher at times breathless throughout a great tale. Twilight Time aced it again in crafting an excellent Blu-ray. They brought out another fantastic choice to represent their wonderful standard of high quality products. They are an amazing company that knows how to treat film, specially film that seems to be over looked. Another awesome Blu-ray by Twilight Time.